Akbar Ganji is one Iran's leading investigative journalists. He was sentenced to ten years in prison and five years internal exile for "undermining Iran's security" by participating in a Berlin conference on reforms in Iran. 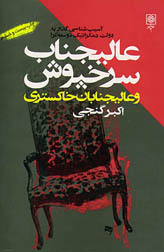 Ganji's most provocative articles appeared following the chain murder of dissident authors and political activists in the fall of 1998. He argued that there had been many other political assassinations during the presidency of Akbar Hashemi Rafsanjani, the current head of the Expediency Council, all of which must be investigated. His latest collection of articles, "Aalijenaab-e sorkhpoosh" (L'Eminence Rouge, "His red-robed highness" (26th edition, Tarhno Publishters, Tehran , 2000) -- a title he chose for Rafsanjani, based on the 17th century French cardinal who sought royal absolutism), has been a bestseller. Up to August 2000, nearly 150,000 copies had been sold. - "Goftam ze mehrvarzaan rasm-e vafaa biyaamooz..."
- Inviting Rafsanjani to a debate: The murder case of F.F. - Elections and memories of the "cold winter slap"
- We haven't scrutinized Rafsanjani yet!